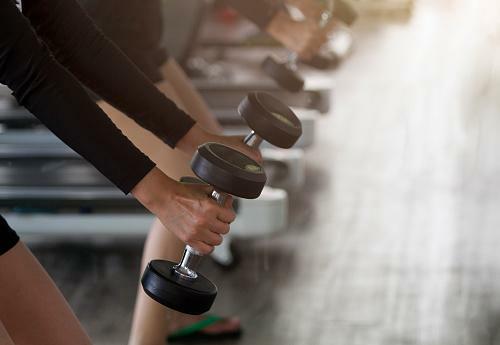 If you're a mostly happy gym rat but the spin class and the weight room are edging toward the routine, add a new focus and flavor to your workouts. CorePower Yoga will get you stretching and sweating with a mix of sun salutations and free weights; it's yoga, but it's also an upscale gym where you'll probably find more grunting than chanting. CorePower Yoga is a physically focused workout yoga adaptation that takes vigorous power yoga and a vinyasa practice into a whole new realm. It's like an ashtanga session plus a hot yoga program plus a cardio and strength training routine all in one. The system is a franchise that features slick gym-like settings and well-trained teachers, often with assistants who adjust your postures. It also features levels of difficulty from beginner to advanced with the option of hot yoga classes for the upper levels. There are studios nationwide, per-class fees or monthly and unlimited memberships, and a hybrid approach incorporating popular gym-stye fitness with classic yoga poses. Trevor Tice, a successful IT entrepreneur, opened the first CorePower Yoga studio in Denver in 2002. Tice turned to yoga for rehabilitation after shattering his ankle in a climbing accident. Visits to numerous studios and styles of yoga during his business travels inspired Tice to create a fusion of high energy fitness workout and yoga routine to address cardio, strength training, and stress reduction in a one-stop approach. The result, CorePower Yoga, now has more than 150 studios across the U.S. and is opening studios in new markets. Tice died in 2016, but his expanding yoga empire continues to be run from its Denver headquarters as a private company. The 150+ studios range from the West Coast to the Big Apple and share spa-like, "green" buildings with multiple classrooms, lockers, and showers. Some locations have large changing room and retail boutiques. There are 200-hour teacher training programs, yoga retreats and boot camps, detox sessions, and other popular fitness-wellness offerings. Memberships include drop-in options, with a sliding scale of prices (New York City costs $32 per single class). A Black Tag national unlimited membership lets you access classes anywhere, but locations such as NYC charge an additional per class premium. You get a choice of three main programs at CorePower: basic CorePower, Unlocking Athletic Power, and Soul of Strength. Core Power: You'll focus on power yoga moves to tighten the abs, lengthen the spine, tone major muscles, and strengthen your back. An instructor may be assisted by a trained teacher who adjusts postures. Unlocking Athletic Power: This takes it up a level to target the abs, back, hips, and pelvis. Soul of Strength: It's a faster-paced, mind-body mindfulness focus. The studios are all warm (around 85 to 90 degrees Fahrenheit), but Level 2 and above classes offer a range of hot yoga temperatures from 95 to 104 degrees Fahrenheit to increase the challenge and the sweat-detox effect. You can sign up for hybrid classes that include Pilates, Barre, and spin with yoga - as well as add HIIT (high-intensity interval training) and strength circuit in a class called Core Cardio Circuit. Yoga Sculpt is a mat class that incorporates free weights with yoga asanas; you're pumping iron while doing lunges, squats, and curls in those Warrior I, II, and III poses. Yoga is central to all classes, but CorePower is not classic yoga, and you get a lot more "gym" than Yoga Sutra. Devotees of CorePower Yoga are an enthusiastic bunch. Check in with your friends for a first-hand opinion or try a week of free classes to see if it's for you. Yoga Journal says: "CorePower focuses on body transformation and offers intense, strength-building vinyasa classes set to music that will make you sweat." Bloomberg L.P describes the franchise as "…a uniquely holistic mind-body workout. Offerings range from restorative classes to physically demanding, muscle-sculpting workouts." Dallas' D Magazine writes: "CorePower Yoga's Zen atmosphere and friendly, knowledgeable instructors guarantee an exhilarating hour for both your mind and your body." Washingtonian Magazine quotes a Georgetown instructor at a hybrid morning class, who characterized CorePower as "...yoga on steroids." Individual user reviews on various sites such as Yelp rate CorePower Yoga studios by their specific experience. Users in the New York City location, for instance, weren't happy with the support columns in the studios that can partially block the view -- an unavoidable feature of many older loft-like buildings used for fitness and dance in Gotham. CorePower Yoga may be just your thing if your primary objective is to tone and strengthen your body with a strong yoga flavor to remind you to breathe deep. The studios are ideal for travelers who want a familiar experience wherever work or vacation lands them. The vibe of the classes is equal parts spiritual and sweat-centric -- CorePower is body- not bodhi-focused. If you love your yoga and your gym and have trouble choosing between them, a few sessions at CorePower may help to resolve your dilemma and speed you on your journey to enlightenment, or the next size down in your favorite jeans.